When it comes to fun, quirky pop punk, Weezer is hard to beat. The Blue Album seems to be in my car pretty much constantly and is good for many miles of rambunctious sing-alongs. 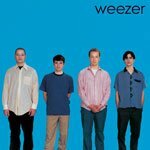 One of the most signature tunes off of Weezer’s first album is Undone (The Sweater Song). It took me many hours of on-and-off fiddling with the song to figure out how to finally play the riff right on ‘ukulele. The secret finally came to me and I can’t believe I didn’t see the solution sooner! All it takes is tuning the bottom, 1st string up a whole step. (Obviously, you’ll want to be careful when you do this depending on the tension of your strings.) For me, a baritone tuned in this way fits the song in a comfortable singing key, but a standard-tuned ‘ukulele might work better for those with a higher range. Even without the funny tuning you can still play the chords. Just check out my chord diagrams page. Matt: Hey brah, how we doin' man? Matt: It's been a while man, life's so rad! This band's my favorite man, don't ya love 'em? Matt: Aw man, you want a beer? Matt: Aw man, this is the best. I'm so glad we're all back together and stuff. This is great, man. Matt: Hey, did you know about the party after the show? Matt: Aw man, it's gonna be the best, I'm so stoked! Take it easy, brah! Mykel: Did you hear about the party? Mykel: Um, I think I'm gonna go but, um, my friends don't really wanna go. Could I get a ride?